What is it? A structure in the shape of a sort of semi-circle or arch that is made of corrugated metal, iron or steel. It is a QUONSET HUT! These structures can be seen around the world because they are relatively cheap and easy to build, they are resilient against the weather and they can store a lot of stuff without posts or vertical elements to get in the way. They are an incredibly strong shape. The name Quonset comes from the town in Rhode Island where these were first invented and produced, Quonset Point. 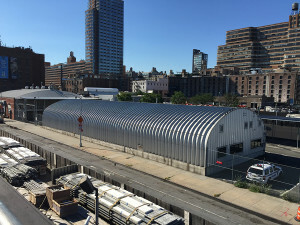 Quonset huts were first used by the US military for housing and storage during WWII. The military needed housing for soldiers that could be constructed quickly and easily, as well as easily transported across the ocean. According to Quonsethuts.org, these structures were orginally called T-Rib Quonset Huts, and the structures could be shipped in twelve crates and assembled in one day by 10 men. Can you imagine if they had to build a brick house for all of the soldiers to live in? Not possible. Eventually, the basic arch style of the structure was adapted. The largest items inside had to be placed in the center of the arch, where it is tallest. So, to make the whole building taller so that there was more usable space in the sides of the building, they started to build the arch on 4 foot vertical side walls. More useful, for sure, but perhaps not as simple. An American company called Steel Master manufactures these structures. They have sold them to farmers to store hay (it needs to stay dry all winter), and to other people to store airplanes (airplane hangars.) By the way, a hangar is not the same as a hanger. A HANGAR is a structure where airplanes are stored and and a HANGER is a shape of wood or metal that is used to hang a piece of clothing in your closet. Dont try to store your airplane on a hanger. This quonset hut is located next to the High Line in New York City. There are many located near construction areas to store and protect equipment and supplies. 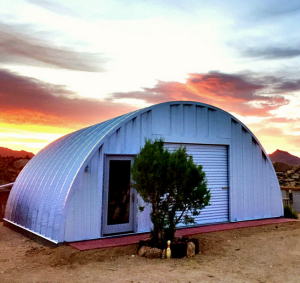 Send photos of your Quonset Hut or one you have seen and we will create a gallery. Email us with photo and location.